An authentic Cubano? No. 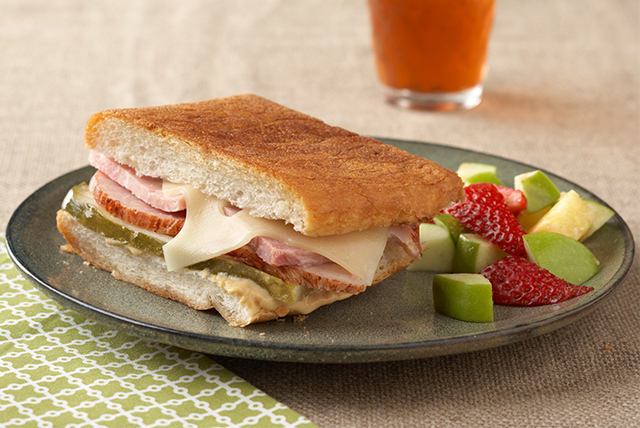 But our Cuban-Style Ham & Turkey Sandwiches are ready in less than half an hour, serve four and taste terrific! Spread bread with mustard; fill with all remaining ingredients except butter. Melt butter in large skillet on medium-high heat. Add sandwiches; cook 4 to 6 min. on each side or until cheese is melted and each sandwich is golden brown on both sides, occasionally pressing sandwiches with back of spatula to flatten slightly. Prepare using 10 slices OSCAR MAYER Deli Fresh Turkey and/or OSCAR MAYER Deli Fresh Shaved Ham instead of the CARVING BOARD Turkey or Ham. If you have a sandwich press, waffle iron or griddle, you can use that to cook these sandwiches instead of the skillet. Watch carefully and adjust the cooking time as needed.